Have you ever experienced a sudden burst of bicycle tires or other emergency situation during your cycling trip? Sospers powerful bike repair kit comes with nearly everything you need to fix bike tire. It is not only bike tools, can also do basic maintenance work, can be used as daily household repair tool. It can handle any flat tire, whether a mountain bike, road bike or BMX. It also has ball needle valve to inflate sports balls like basketball,football,volleyball or soccer ball etc. Note: Pls don't use it vigorously. And pls don't use it to directly remove the bike wheels. Convenient to hang on your bike tube or frame. Can put essential repair tools you needed into it, such as bike multi tool, mini pump, etc. 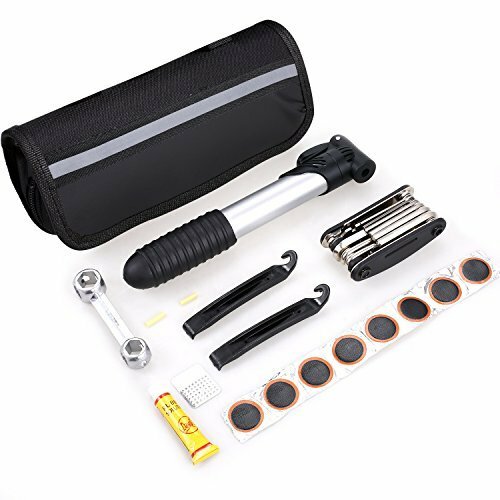 EASY TO USE - Up to 100 PSI capacity that allows you to use the bike mini pump to inflate the bike tire from mountain bike (MTB pump) to road bike (Road bike pump). In addition, this bike hand pump can be used as ball pump to inflate the sports balls with the air needle as well. DO NOT RIDE WITHOUT IT, it is an indispensable part of bike accessories for you! PORTABLE: A bike bag comes with Kitbest bike repair tool kits. You are able to carry all those maintenance tools easily. It can be as a traveling tool kit to help you fix most problems of bike while riding outside. If you have any questions about this product by Sospers, contact us by completing and submitting the form below. If you are looking for a specif part number, please include it with your message.